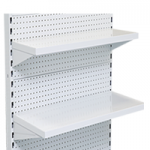 Slatwall shelving is one of the most ideal modern types of shop shelving due to its versatility, space-saving capacity and neat look. 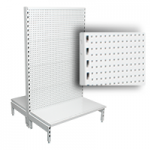 Almost any type of retail establishment can make use of a good slatwall display and there are hundreds of products and accessories to help shops optimise their layouts. 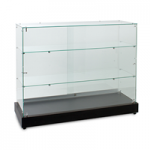 With slat displays, there is no more head scratching over those oddly-shaped difficult to display products. 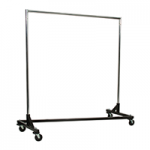 Even large items such as musical instruments and sports equipment can be accommodated. 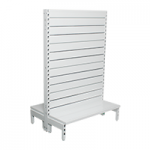 Slatwall has many benefits, which is why more and more retailers are choosing slat panel displays when they decide on an upgrade or refit – from newsagents and chemists to arts and crafts stores and surf shops. 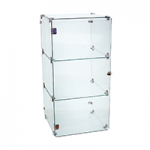 Display units are highly versatile, available as wall-mounted units or free standing gondola units, and comes with a range of accessories such as hooks, shelves and display bins. 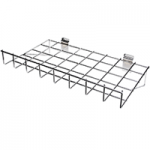 This means that it can accommodate a variety of products from rows full of grocery goods to bicycles mounted on the wall. In addition to this, it’s easy to install and change around which is ideal for stores that have seasonal turnaround of stock or just like to have a makeover every few months. 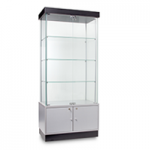 It’s attractive, with panels coming in a range of different colours and finishes. 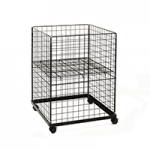 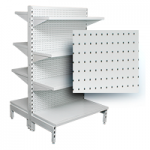 It’s also great for saving space, as the units have a high load-bearing capacity so can generally hold more stock. 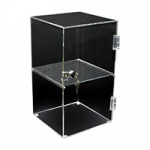 To top things off, displays and accessories come at affordable prices and, as they are highly durable, will last a long time, meaning that retailers get more for their investment. 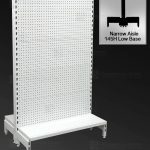 Slatwall gondola shelving – these free-standing mobile units are perfect for creating aisles or window-facing displays. 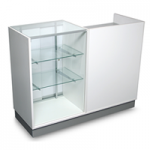 Stores can maximise their space with double-sided gondola units which allow retailers to change displays and rearrange shop layout at will. 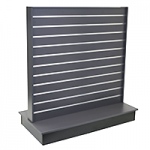 Wall-mounted displays – available in an array of colours, slat panel display walls enable shops to turn every inch of wall space into retail space. 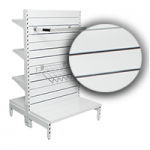 The sturdy panels can be fitted with shelving or accessories to showcase heavy and difficult to display products. 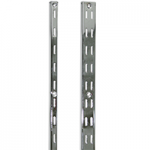 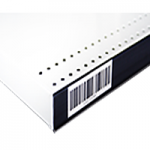 Slatwall shelves – shelves can slot into the grooves within the slatwall panels and are available in a variety of sizes and materials. 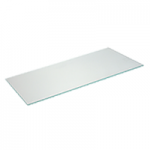 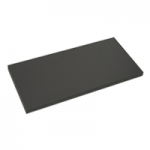 This includes melamine wood shelving, which can be utilised to create eye-catching melamine shelving systems ideal for showcasing expensive kitchenware or ornamental goods; glass shelving, which is perfect for jewellery or decorative porcelain and has reflective qualities to brighten up displays; and acrylic slatwall shelves which are great for electronic goods, shoe displays or magazines. 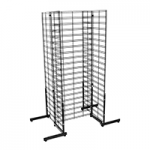 Slatwall accessories – slatwall accessories in Australia include display prongs, faceouts, picture hooks, waterfalls, sign holders, acrylic bins and wire baskets which can be used to tailor displays for purpose. 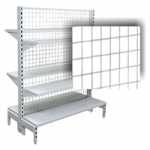 Here are just a few possible uses of slatwall for different types of products. 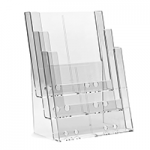 Books & magazines – coming in all shapes and sizes, books and magazines can be challenging to display effectively. 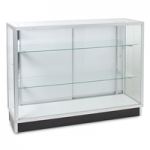 Slat displays and accessories give stores options if they want to diversify away from traditional shelf displays, with angled acrylic shelves allowing products to be displayed cover-facing. 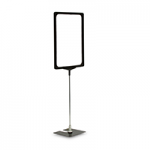 Thin magazines and brochures can also be placed in vertical sign holders for window display. 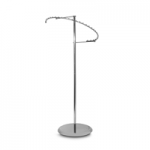 Clothing – garments can be folded and displayed on horizontal shelves or placed on hangers and displayed on hooks, prongs or waterfalls. 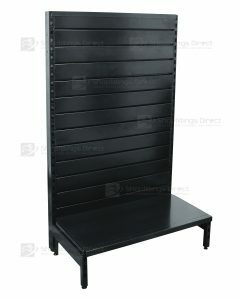 Hats and caps can be neatly showcased using hat brackets, while shoes and trainers can be placed on individual shoe stands or shelves. 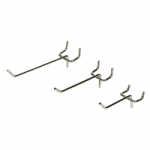 Jewellery – bangles, bracelets and necklaces can be tastefully organised using slat hooks and prongs to create an attractive wall display. 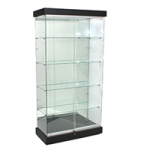 Watches can be lined up on small acrylic or glass shelves. 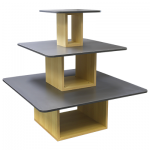 Arts & crafts – melamine or glass shelving is great for showing off porcelain or ceramic goods. 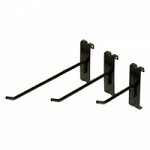 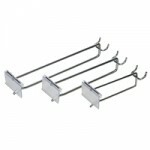 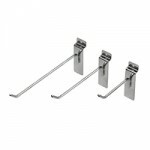 Framed pictures can be arranged to into a small gallery through the use of picture hook accessories. 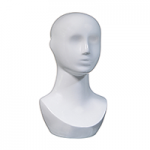 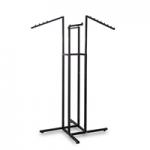 Sports equipment – sports goods come in all shapes and sizes and can often be challenging to display effectively. 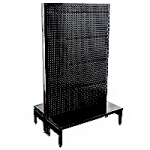 Slat panels, thanks to their durability and versatility, allow retailers to place items such as tennis rackets and hockey sticks on wall displays. 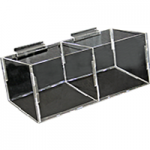 Footballs and basketballs can be placed on ball display brackets, while smaller items can be put in display bins or baskets. 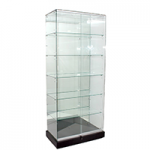 Electronic goods – acrylic stands and shelves of different sizes and at varying angles can be used for mobile phones, laptops and tablets. 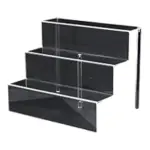 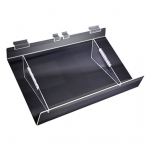 Stationery – use acrylic compartment bins to help sell a range of smaller stationery items such as pens, pencils, staplers, etc., while shelves and stands can be useful for larger folders and files, and packaged items can be placed in bins, baskets or on hooks or prongs. 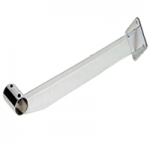 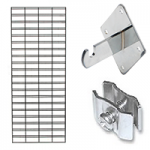 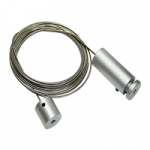 Accessories – the wide range of slat panel attachments can cater for all kinds of accessories, from hooks and prongs for clothing accessories such as bags and scarves to display baskets for those awkward to display cheaper, smaller items. 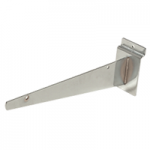 If you’re looking for help in determining which slatwall solutions might be best for your outlet, our shop fitting experts will be happy to discuss your requirements. 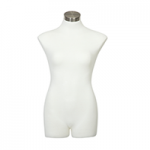 Call us on (02) 9608 5122 or drop us an email at sales@shopfittingsdirect.com.au. 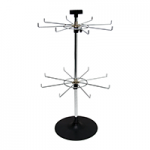 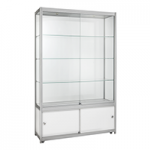 We have an extensive range of products, accessories and gondola shelving for sale and we sell all of our shop fittings online at www.shopfittingsdirect.com.au.